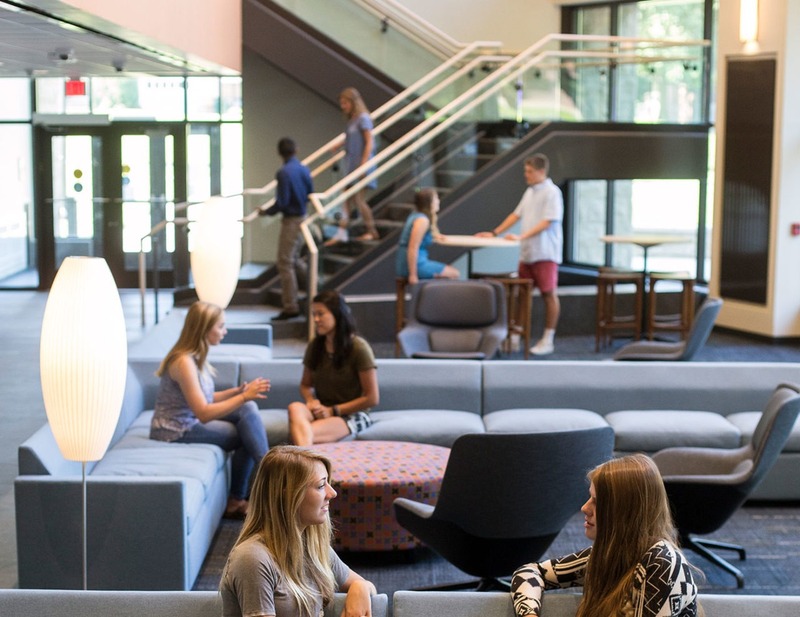 Hope College - Student Center | Trex Commercial Products, Inc. 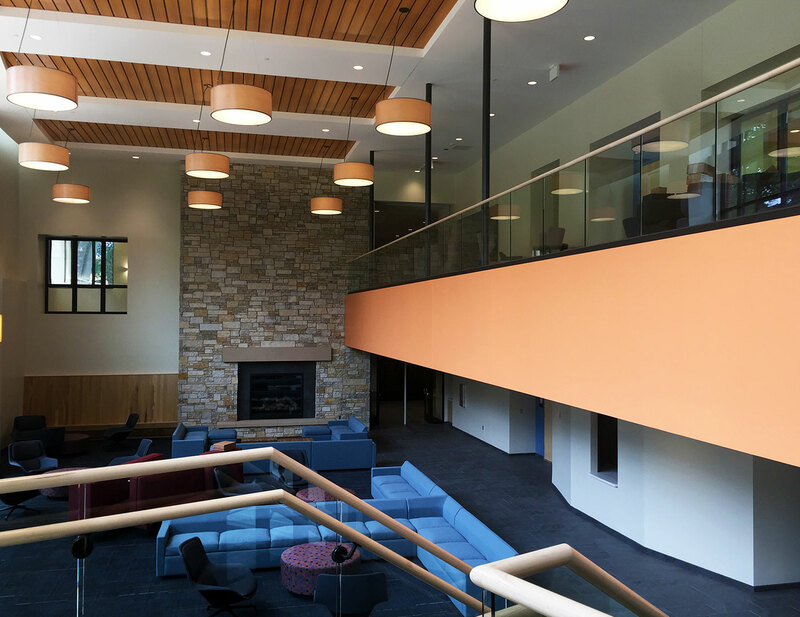 The Track Rail system, along with tempered glass, maple hand rails and a matching maple top cap, offered the perfect railing system to give the space a sense of lightness and freedom – ideal for fostering community among students and campus organizations. Photo courtesy of Hope College. The 2” hard maple handrails are attached to both the glass and the wall, and complement the warm architectural features of the building. 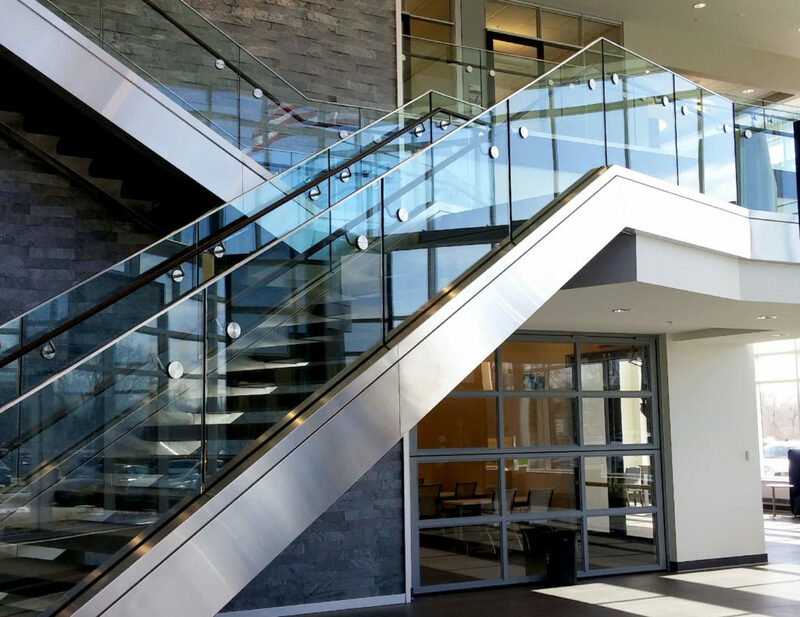 Aluminum through-glass standoffs with a bronze anodized finish are used to secure the railing to the glass, while the rail is secured to the wall via aluminum wall-mounted standoffs. The Center’s overlooks were created with TCP’s Track Rail system, which is attached to concrete via epoxy anchors. This railing features 1/2” clear tempered glass with exposed edges on both the overlook and the stairs, polished for a smooth finish. 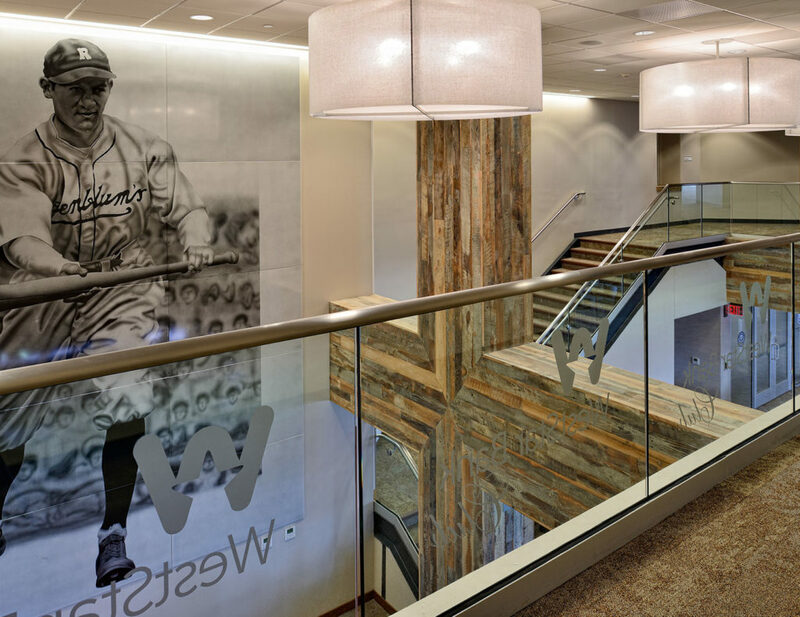 A total of 341 linear feet of Track Rail was used to create the open-concept lobby of the Jim and Martie Bultman Student Center, designed to foster inclusiveness within the student community. 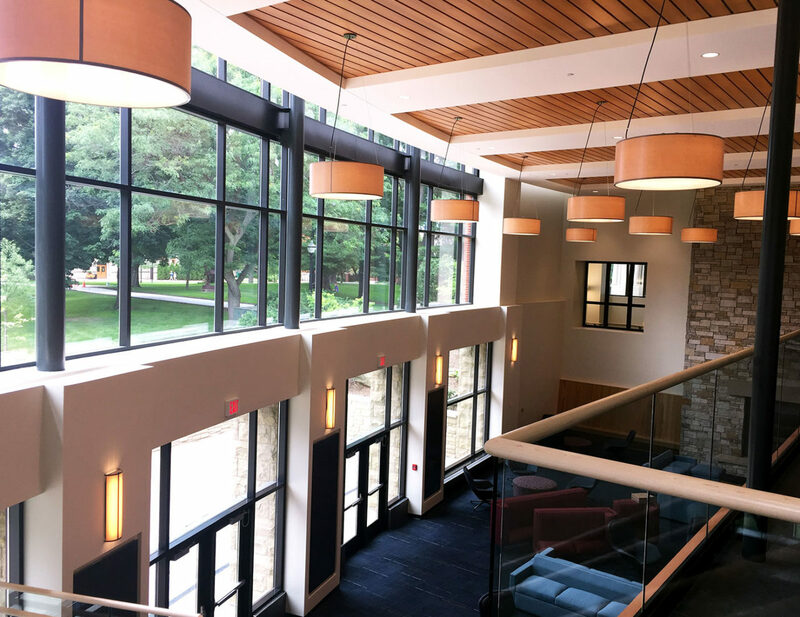 Glazier Architectural Glass & Metals, Inc.
Hope College in Holland, MI, unveiled the 42,000 square-foot Jim and Martie Bultman Student Center – the college’s first new dedicated student-center space in more than 35 years. 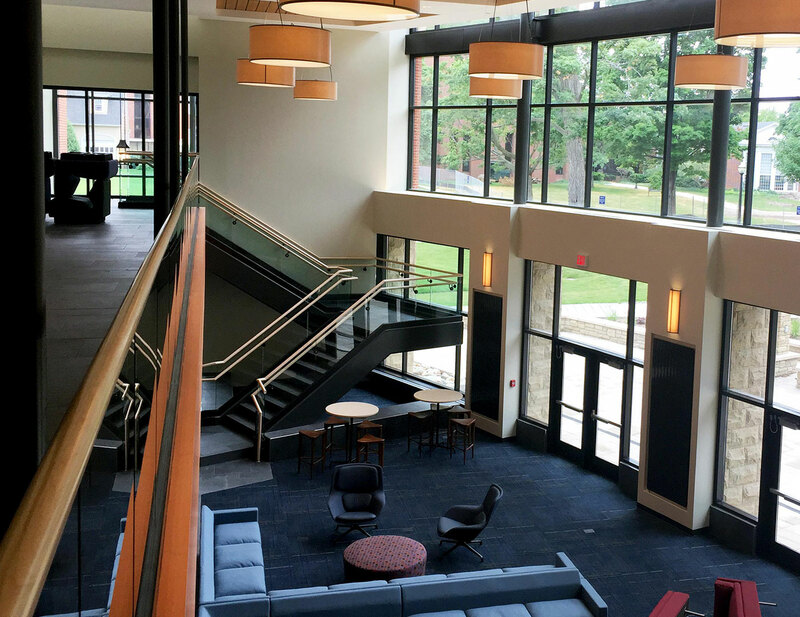 The center includes a large multipurpose room with an adjacent patio, a lounge with fireplaces for student gatherings, as well as meeting areas and a coffee shop. 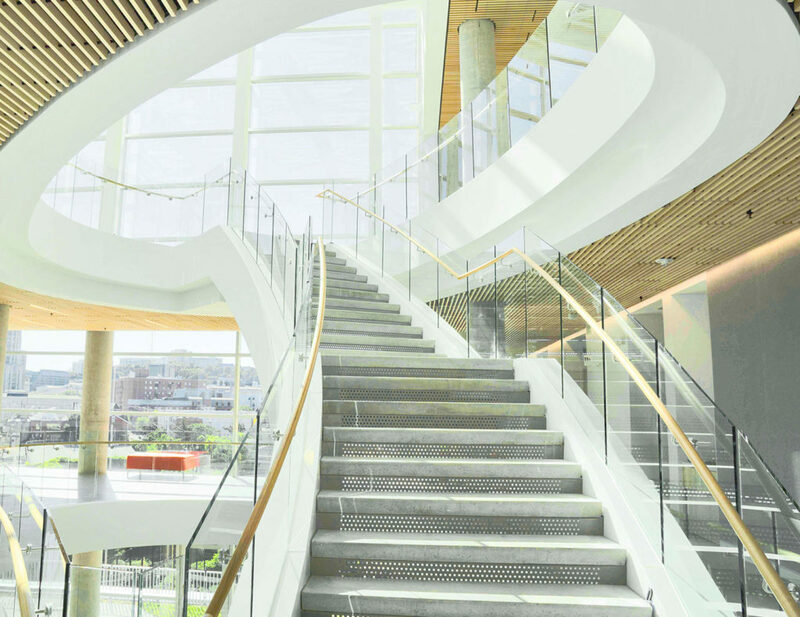 TCP’s minimalist Track Rail, along with tempered glass, maple hand rails and a matching maple top cap, offered the perfect railing system to give the space a sense of lightness and freedom – ideal for fostering community among students and campus organizations.